This first few weeks of March have been a crazy whirlwind of teaching and training. I have felt so busy both at home and school. 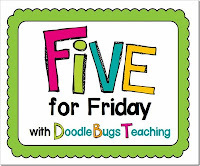 I decided to get up early this morning to get a few things done before my daughter's basketball game, and while I'm sitting in my pjs enjoying my 'Cuppa Joe,' I decided to link up with Doodle Bugs and Amanda at Teaching Maddeness for their linky parties. #1: I have spent the last week or so in two different professional development conferences. The first was actually LAST Friday. 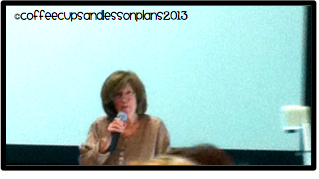 I had the opportunity to hear Lucy Calkins speak. She is wonderful... I can't express that enough to people. She energizes, she puts things in perspective, she speaks "teacher." I have missed Lucy a lot as a sixth grade teacher. We are the balance year between her writing perspective and Nancy Atwell. Hearing Lucy speak last week helped me focus more on writing task planning. It gave me guidance with writing in the Common Core, and just made me feel better as a teacher.. I love THAT type of conference! I can't wait for her Writing Units to come out for 6th grade.. projected for January 2014! #2: The second professional development I went to was about training people to score our NYS Math Assessment in April. This training was put on by BOCES. Very interesting changes coming on the rubrics. Hopefully in our student's favors! This is going to be a very difficult year with the shifts in the Common Core. Across the state they are projecting a 40% drop in test scores! UT OH! DIDN'T DO poem from the perspective of the antagonist. #4 My Smarties are finishing up our unit on RATES. Our Interactive Math Notebooks have really be a godsend for this unit. We have to remember how to divide decimals and reduce fractions, and all I have to do is refer to page numbers in the notebook, and the smarties can find the resources they need for work. I love that notebook. #5: Big changes are going on at my school. We work on 3 man teams, teaching a two block ELA period and then 3 core classess, so I teach math and ELA. Our principal announced at our staff meeting that he will be mixing our teams up next year. Our building is in an uproar. I have worked with my team for years. It will be hard to leave them and work with someone else. He has not announced WHEN he will be telling us our new teams. I hope it is soon so that we can all adjust and move on! This is a great example of how March really can be a LION! Stop by and visit Amy at Teaching in Blue Jeans. She is celebrating her 40th birthday with a few giveaways. I donated my Wacky Wordies Algebra Editon. There are giveaways for several grade levels. Great stuff to be had! 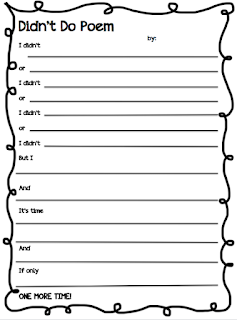 I have never seen an "I Didn't" poem before - thanks for sharing. I hate changes like that - if your team works well together - why change. I am sure your new team will be great too! I've begun to see more and more about schools drastically cflipping teams, teachers, and grade levels. 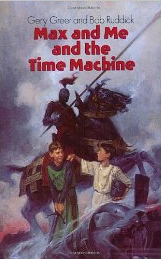 We haven't gone through that (yet), but I'm always curious about the ramifications of it. Especially when you've got strong team that do great teaching and have great chemistry. So sorry to hear about the mix-up....those types of things always STRESS me out!! :( I'm glad you've had some great professional development opportunities though! Makes me excited about our Whole Brain Conference this summer!! I am so jealous that you got to hear Lucy Calkins speak! That is one of my teacher dreams. I *Puffy Heart* My Dad! Percentages with my Peeps Freebie!